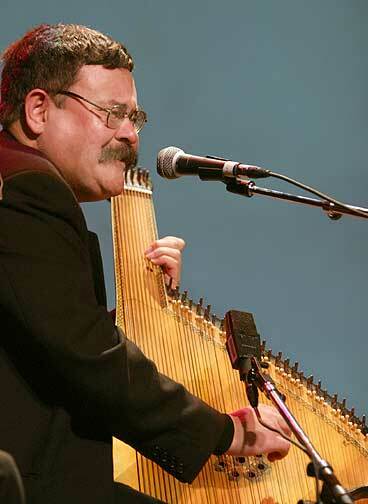 Julian Kytasty is an Ukrainian-American composer, singer, kobzar, bandurist and flute player. He was born in 1958 in Detroit, Michigan, in the family of refugees. His first studies were in the Ukrainian Bandurist Chorus, in which his father, uncles and grandfather played before him. He has been a resident of New York since 1980. He moved there to found the New York Bandura Ensemble (which also at various times included minimalist composer-bandurist Michael Andrec, composer-lutenist Roman Turovsky-Savchuk, Natalia Honcharenko and Juri Fedynsky), and began a career as a solo artist and bandura teacher that has taken him all over the world, from the Inuit lands to Patagonia. In 1989 he was invited to tour Ukraine, performing over a hundred concerts as a soloist as well as with a bandura trio. Julian Kytasty holds a Masters degree in music (Theory and Composition) from Concordia University in Montreal (his undergraduate studies were in military history). He is the author of original compositions and arrangements that have entered the standard repertoire of bandurists around the world. He has also created avant-garde music for instrumental groups, choirs, and incidental music for dance and theatrical performances, notably for New York's Yara Arts Group. Julian is a frequent speaker on the bandura and its tradition. He has been a guest lecturer at many universities including Yale, Harvard, Wesleyan, and the University of California. Julian has recorded for London's November Music label: Black Sea Winds - Music of the Kobzari of Ukraine. He also has collaborated with Canadian singer Alexis Kochan and their ensemble Paris to Kyiv on two CDs, Chinese pipa player Wu Man, Mariana Sadovska, Brave Old World and has recorded with his own group The Experimental Bandura Trio.